TECHNOLOGY-PORTFOLIO.NET - Nokia has presented its newest product called Nokia One. It is true that this product is not a cellphone that has wow specifications, considering its affordable price, which is under 100 USD. Armed with an Android edition of Go Oreo that is efficient so that it can run applications smoothly on devices with minimal specifications, such as 1GB RAM. 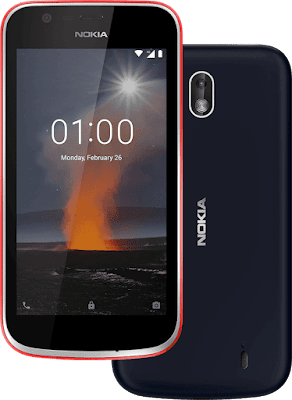 The manufacturer's HMD also supplies this Nokia One with 1GB of RAM because the included applications are designed to use less storage and data, so they can do more and accommodate more photos and applications on the cellphone. An example of an efficient application that we mean is Youtube Go. Android 8.1. Oreo (Go edition) does not include unnecessary applications or hidden processes that can be felt to drain the battery and cellphone memory for cpu efficiency, memory and battery life. The Nokia One battery can be removed and has a capacity of 2150 mAh. This phone also supports 4G and dual SIM card connections. The rear camera on the Nokia One has a 5MP sensor with an LED flash while the 2MP front camera is sufficient for photographic needs as needed. The CPU used is MT6737M Quad Core with a speed of 1.1 GHz while the internal storage of 8 GB is quite minimal compared to most mobile phones currently in circulation but don't worry because it has a microSD slot that supports up to 128 GB capacity. The screen is also classified as mini for now because it measures only 4.5 inches with FWVGA resolution. The color that can be chosen is Warm Red, Dark Blue.